Michael McFadyen's Scuba Diving - Six Fathom Reef This is a Sydney dive site that some people would claim is not worth diving. I certainly would not agree with this view as I will explain later in this article. Six Fathom Reef (also known as Simpsons Reef) is located at the mouth of Port Hacking on the southern outskirts of the city. 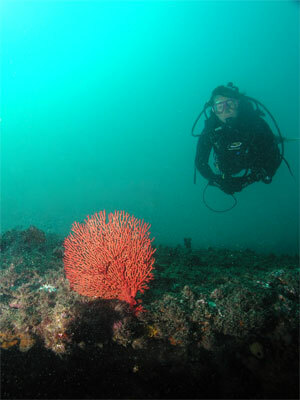 Roughly to the north of Jibbon Point (Reef) in Royal National Park, Six Fathom is a site that is generally only dived in poor weather conditions, at least by experienced divers. Its location, protected to a certain degree from southerly and south-easterly swells by Jibbon Bombora, means that in these seas it is generally the only open ocean dive site available at Port Hacking. Therefore, when the seas are big, this is the fall-back dive site. Because it is nearly always diveable in big seas, people do not normally dive it in calm seas and do not see it at its best. In good seas, divers tend to want to go a bit further afield to other spots. GPS Marks of 34° 04' 18"S 151° 10' 13"E (using AUS66 as datum - see my GPS Page for more details) will put you or the top of the reef. Run towards Oak Park Toilets (or away perhaps) as shown in the mark at left and get the other mark lined up. When the depth sounder shows a wall dropping from 11 to 16 or so metres, anchor. Gradually rising from a sandy bottom of 24 metres, the reef has some small walls of one or two metres and gradually rises up, as the name implies, to about 11 metres (or 6 fathoms). There are some small overhangs and a couple of little swim-throughs, but generally the dives here are conducted along the southern and eastern edges, although the western wall is probably the most distinct and offers, I believe, the most interesting dives. It can some times be a bit hard to get the anchor to bite into the reef and you can often find yourself hooked onto one of a number of larger, low rocks that extend to the east from the reef itself. 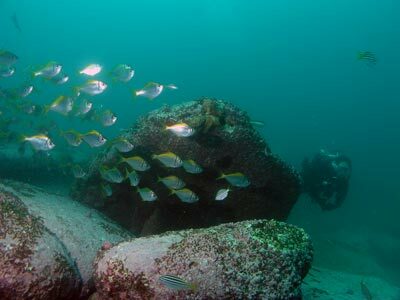 If diving with a charter boat, once you descend, if you are on a rocky area that goes for more than a few metres in all directions, you are on the reef. Head east or south-east until you reach the sand. If you find yourself on sand or near one of the rocks, head north west until you see the reef itself. Once the edge of the reef is encountered, I generally follow it in an anti-clockwise direction to the south then west and finally to the north. At first the main wall is on the sand, but as it turns to the west a better wall is located to the north of the sand. This is fairly obvious as you go along. On this southern side I usually do not stick to the sand but follow the larger wall which supports more fishlife. This wall has some overhangs and then turns to run to the north. The wall is more spectacular here but the water is often a bit dirtier. Generally the fishlife on this wall is spectacular. Ladder-finned pomfret, bullseye, yellowtail, seapike and one-spot pullers are normally present in huge numbers, especially in the shallower 11 to 14 metre depths. Bream, yellowtail kingfish and trevally are also seen in large numbers. After you have followed the reef for about 20 minutes, you should return back to the anchor area. You could go pass the anchor for a bit if you still have sufficient air and bottom time. On later dives here, rather than returning back along the same route, you can cut across the top of the reef and approach the anchor from the opposite direction. Since early 1994, members of the St George Scuba Club have been exploring Six Fathom Reef a bit and have many different dives on the western side of the main reef. 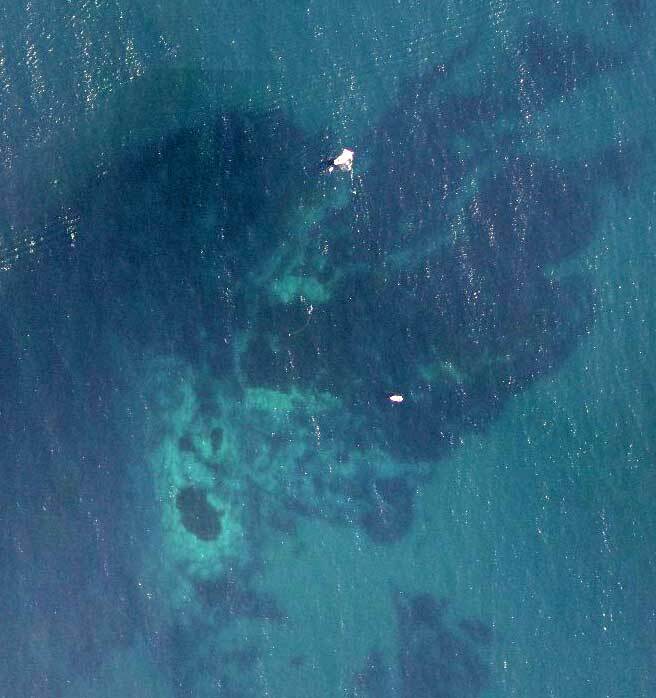 Here the reef jumps up a metre from the sand (21 metres) and has some excellent sponge gardens. This lower reef runs roughly to the north-west from here. About 15 metres to the east there is another wall of about 1.5 to 2 metres (17 metres) and a bit further across you will encounter the main wall which jumps up about 5 metres. These walls run north-south. A good dive is to explore the deeper western wall then the shallower wall before finishing on the main wall. Follow the deeper wall to the north-west and you will find a lot of small overhangs. In May 2002 I found six pineapplefish about 30 metres along the wall. Continue in the same direction and after a while it deepens to 22 metres and you will come to another small wall on your left. Drop over the wall, noting where you met it, and continue to go north-west. The depth on the sand will now be 24 metres. Turn around after about 15 metres and follow the top of the reef back to where you meet it in the first place. If you go further west over the sand (in good visibility), you will see an even deeper wall to the west of the location where I normally anchor. This is about two metres high and the sand here is almost 27 metres. There is excellent sponge, sea squirt life here, with lace corals and gorgonias. This extends quite a way, I have never reached the end of the wall. Locate the anchor and then head north along the main wall. There are some small boulders and rocks along the wall. The depth on the bottom is about 16 metres and about 12 metres on the top. The fishlife along here can be prolific, with seapike, silver sweep, yellowtail and ladder-finned pomfret sometimes in huge numbers. Return to the anchor area and explore this area before ascending. The attractions of this dive site include the above average fishlife, some good sponges on the southern side and a number of nice gorgonias on the south-eastern corner. The most important attraction is, of course, its diveability in big and bad seas, but do not let this make you think that this is the only time it can be dived. 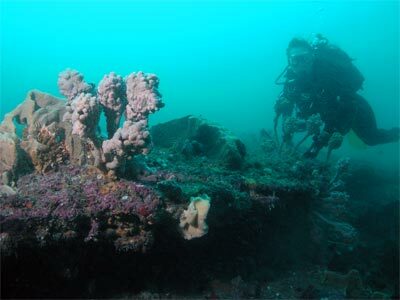 It also makes an excellent second dive due to its relatively shallow depth and close proximity to Port Hacking. Tides do not really affect the site but after periods of prolonged heavy rainfall, the water can get dirty. As well as the fish noted earlier, fish to be seen here include blue groper, red morwong, magpie morwong, eastern blue devils, black reef leatherjacket, six-spined leatherjacket, yellow-finned leatherjacket, crimson banded wrasse, combfish, wobbegong and Port Jackson shark (in Spring). The low overhangs on the top of the reef are also home to eastern rock blackfish and I have even seen them swimming in the open. Only my second real shark in Sydney (a small bronze whaler) was seen at this location. I also saw a giant boarfish here, the rarer yellow spotted version, on the deeper 27 metres sand area in late October 2000. I have since seen other giant boarfish a number of times at this location. 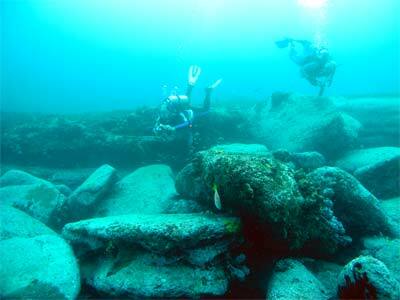 A really nice and underrated dive site worth diving time and time again.